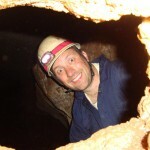 ACT blogger Mick puts his adventure hat on and gives caving and abseiling a red hot go, just an hour out of Canberra. When you think of adventuring, you don’t necessarily think of Canberra, but just an hour out of the centre of the city, in a suitably named small town called Wee Jasper, are some of the biggest and best limestone caves in Australia. On a glorious spring day in Canberra, my 12 year old daughter and I met up with a group of eight other people and jumped on a bus towards our day of caving and abseiling just west of Canberra over the Brindabella Mountains. I have been in a few caves in my life, but generally just the ‘touristy’ ones where you walk along a lit path and admire the limestone creations from afar. Today was going to be a whole lot different. We were provided with all of the equipment we’d need for the day. Overalls, helmet, torch, gloves and abseiling gear. Before we started climbing down cliff-faces, we headed off to our first ‘starter’ cave with an experienced caver. The ‘Signature’ cave was a fairly open cave to start with. Obviously popular with tourists, there were hundreds of signatures on the walls from 30 or 40 years ago. Our guide took this chance to remind us about the beauty of caves and how, unfortunately, people have not always looked after them as they should. The third level of the ‘Signature’ cave involved wriggling on our bellies through a small hole before moving into an open area. Claustrophobia is something you’d not want to have when caving in general, but at no point did any of us have concern for our safety. The guide was happy for us to stay or go depending on our preference. An enjoyable part of caving is the camaraderie you feel with your fellow caver. Helping each other over rocks, between crevices and down ropes give you a chance to bond, which I did on this occasion with my daughter. 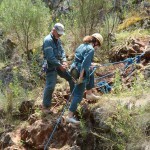 Our next stop for the day was a 15 or 30 metre practice abseil into a nearby gorge. The intention of this was to ensure that we were comfortable with abseiling before venturing towards the larger cave which we would have to abseil into later. Both Rohan and his fellow guide were very helpful, friendly and experienced and my 12 year old had no problems traversing down the cliff face to the safety of the ground below. For myself, this was my first ever abseiling experience and I was hooked! After two trips down I felt like I could take on the world! Before heading off to the larger cave for the afternoon we were treated to a magnificent spread of food for lunch provided by the Real Fun staff. A great array of meats, breads and salads were available for us to keep ourselves sustained for the afternoon. Our last cave involved abseiling one by one from a fairly small opening into an open main cave. As it took some time for each person to do so, a few of us ventured into the cave from a different entrance to meet up with the other group later. 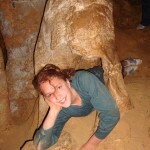 We didn’t mind, as we got to explore the nooks and crannies of the cave instead of waiting up with the other group. Some of the structures within the caves are beautiful including living limestone stalactites and stalagmites. Hard to believe that such beautiful open caves can exist below where we walk! When it was eventually our turn, we lowered ourselves into the main dark cave with just our headlamps to guide the way. It was an awe-inspiring experience and one that I would recommend to anyone that is looking for a little bit of adventure and doesn’t mind getting dirty! After a busy day of walking, abseiling and caving we were treated to another lovely afternoon tea before climbing back into the mini bus and heading back to Canberra. We were dirty, tired and sunburnt, but it was a memorable day out and something that I am glad I got to experience with my daughter. 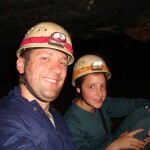 Keen to experience a caving adventure for yourself?